The Half Moon Theatre Company was formed in 1972, shortly followed by the Half Moon Young People’s Theatre and the Half Moon Photography Workshop in 1975. In a few short years, the companies popularity meant it outgrew its original space (an 80-seat rented synagogue in Aldgate), and they moved to a disused Methodist chapel near Stepney Green in 1979. Even in this space the attracted audience was greater than the capacity, so a new theatre was constructed next to the chapel. It opened in May 1985 with a production of Sweeney Todd. After a decline in popularity and a reduced grant, the theatre closed in 1990, and the Repertory company went into voluntary liquidation. 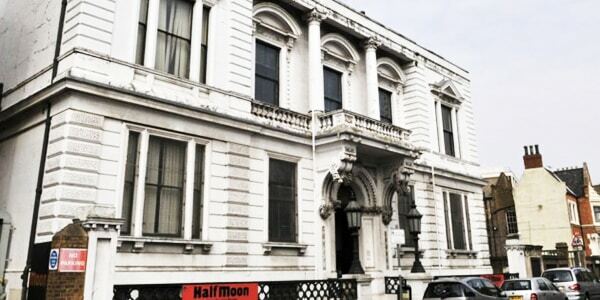 The Half Moon Young People’s Theatre became an independent company, and found a building to use as an East London base (the former Limehouse Board of Works). The company acquired the freehold of the building in 2008 and has renovated the building’s interior and exterior in 2012 and 2013 respectively. The theatre produces professional children’s theatre, as well as offered several creative learning programmes to children up to the age of 18.